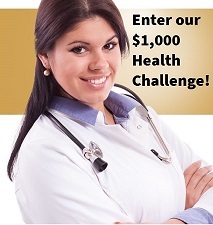 Would you like a chance to win a $1,000.00* (see terms below) cash incentive just for taking a few minutes to learn more about your health status and how to improve your general fitness and overall well-being? Fill out your wellness profile today! At the end of the profile, you will be given a chance to enter your name into the contest. Even if you entered our 2018 contest, you are welcome and encouraged to enter this contest. You may view our previous winners here: view our past winners! After completing a health questionnaire, developed by a team of experts at the Lake Cumberland District Health Department (LCDHD), you can review and print: 1) recommendations about how to improve your general health and, 2) a note for your family doctor listing needed health screenings and vaccinations/immunizations. This is a wonderfully robust health education tool which can empower you to not only better understand your current health status, but also how to improve such through preventive measures and health screenings. We extend our thanks to the Monticello Banking Company for sponsoring the cash incentives and demonstrating their commitment to the health of the citizens of our area. So why not fill out your wellness profile now? Access it at: Health Calculator and Wellness Profile. After you complete your profile, go to our Personal Wellness page to explore information and suggestions related to your unique health conditions and to find community resources which may be of assistance. If you experience technical problems with our Health Calculator and Wellness Profile site, please call 1-800-928-4416 and ask for the technical support department. You must be a legal resident of one of the following Kentucky counties: Adair, Casey, Clinton, Cumberland, Green, McCreary, Pulaski, Russell, Taylor or Wayne. You cannot be an employee or board member of the Lake Cumberland District Health Department or the Monticello Banking Company. You must complete the wellness profile and print your results. If your name is drawn, you must present your printed profile results as proof you completed the profile. You must enter your name and contact information at the end of the wellness profile. There will be a $1,000 first place and a $500.00 second place award presentation. The contest will conclude on December 31, 2019 and winners will be drawn in January of 2020. After several unsuccessful attempts to contact the winner using the contact information provided, LCDHD reserves the right to disqualify the winner and award the prize to another contestant.